Diamonds are being smuggled into the United States of America, and millions of dollars are being lost every year as a result of these criminal activities. The British Secret Service has finally got an idea of how the job is being done: they’ve intercepted a member of the gang who was supposed to help ferry an illegal load of diamonds from London to New York. But they haven’t let on that they know anything about this transaction: instead, they’re sending one of their top men in his place. His name’s Bond. James Bond. 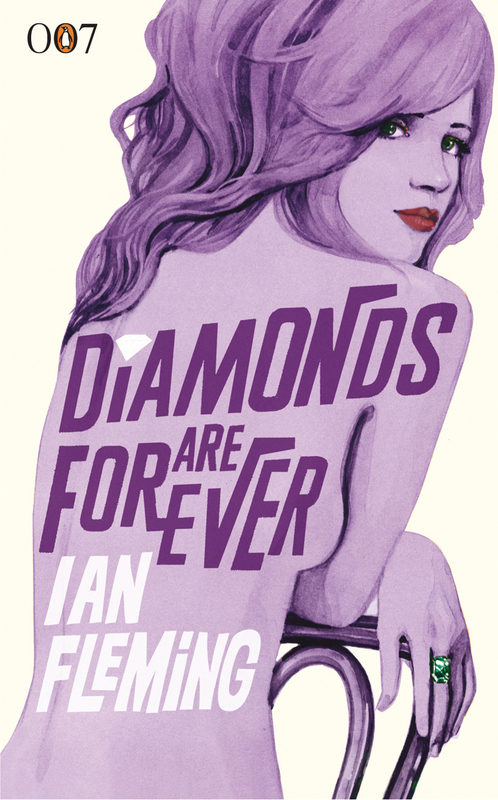 It’s a surprise to me how much I enjoyed Diamonds are Forever, which in itself is surprising. It’s my second time reading the book and I remember my enjoyment surprised me just as much the first time I read it. I suppose it’s because it’s the book that comes right before From Russia With Love, one of Ian Fleming’s most creative and infamous works. I was looking forward to reading From Russia With Love so much that I ignored Diamond are Forever in the process. It was very unfair of me. 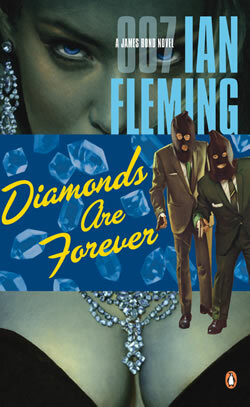 Diamonds are Forever is one of Fleming’s better Bond books. The story appears to be a lot simpler than some of the other Bond books. It deals with a perfectly ordinary crime that is more realistic than some of the earlier Bond plots (although of course the book has its larger-than-life elements). We’re dealing with American gang life, and it’s neither a pleasant nor a romantic life. It’s thanks to Fleming’s writing style that this experiment works so well. He brings his American setting vividly to life and writes about it so well that it alone makes for compelling reading. The gangsters Bond faces off against are quite ordinary. They form the “Spangled Mob” and their only objective is to make money. They employ muscle in the form of two homosexual guns-for-hire, Wint and Kidd, thoroughly nasty sorts who get real pleasure from doing their dirty work. Although one of the lead gangsters has an affectation for the Wild West (even buying a ghost town to serve as his personal playground) he can still look menacing, even in a ridiculous getup. This book marks the return of Felix Leiter, who was understandably absent from Moonraker. He suffered some major injuries the last time we saw him, and as a result had to change his career path somewhat, but he can still help Bond out on occasion and show him around the US in an attempt to decipher the crazy behaviour of Americans. His presence is a welcome one and something of a stabilizing presence in a book that jumps around various settings. But there’s also Tiffany Case, Bond’s love interest and the first serious one since Vesper Lynd of Casino Royale. Her story is one of the most tragic in the series: Tiffany’s mother ran a “house of pleasure” and refused to pay the gangs off one time. She reasoned that the bribes she gave to the cops would ensure she’d be protected from the gangs, but she was wrong. They cleaned her out and then had themselves a gang-bang with Tiffany. As a result of the psychologically scarring experience, Tiffany refuses to have anything to do with men and presents a cold, emotionless façade to the world. But at heart she is a vulnerable, emotional girl. Fleming treats this character with sympathy and tenderness and does a terrific job at making Tiffany a credible, complex character – one of his best female characters. I don’t want to say too much about the way she develops during the course of the novel, but it is handled extremely well. 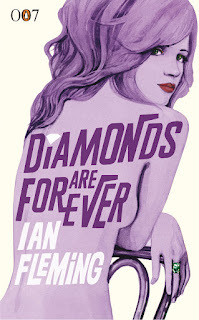 Overall, Diamonds are Forever is a terrific little book. It doesn’t get the same level of fame that Dr. No, Goldfinger, and From Russia With Love get, and perhaps that’s to its advantage because it’s capable of genuinely surprising readers with just how good it is. The American settings are excellent, the gangsters are credible threats while retaining some larger-than-life characteristics, the Bond girl is one of Fleming’s best creations, Felix Leiter returns to the series. It’s a bit lower key than the books that form a sandwich around it – i.e. Moonraker and From Russia With Love – but it’s a highly entertaining read well worth your while. 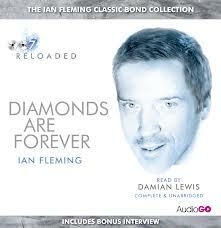 Notes on the audiobook: Diamonds are Forever was brilliantly read by Damian Lewis – who, interestingly enough (at least for this blog), played the role of Leonard Bateson in the TV adaptation of Agatha Christie’s Hickory Dickory Dock. Lewis really brings the setting to life brilliantly, and does a terrific job with Bond and Tiffany Case. He also does a great job at conveying a sense of menace from the gangsters, especially Wint and Kidd. In the post-audiobook interview, Lewis admitted he’d never read this particular Bond novel (although he had read a few others). He expressed great enthusiasm for the book, and it came through in the recording. This is giving Dan Stevens some serious competition for the title of “Best Reading” thus far in the “007 Reloaded” series. The book has received quite a bit of criticism from some quarters. The Gangland/Diamond smuggling elements are seen as being incomptible with spying, but that does seem rather unfair. It's actually an excellent crime thriller, and Fleming's friend Raymond Chandler congratulated him on his mastery of the American idiom. Tiffany is one of Fleming's most vivid Bond girls. Those who complain about 'Bond girls' should read this. She's damaged but tough, with that spark that brings fictional characters to life. She manages to challenge a number of Bond's prejudices and preconceptions, and really earns her place in his affections. There is an element of travelogue in the book, and the descriptions of Las Vegas at that time are fascinating. It's pretty obvious just how much Fleming despises the place. There is a description of lots of old ladies filling up slot machines with small change. Every time that one of the machines pays out it rings, and the woman respond to the ringing of the bell with a sort of blank avidity, drooling like Pavlov's dogs. Like you say, it's not absolutely top-notch Bond, but Fleming had nothing to be ashamed of about it. We obviously agree 100% about Tiffany Case. I'm not sure if she's my favourite Bond girl -- I really love Vesper Lynd -- but she's definitely in the top. I also like how the slow drifting-apart between her and Bond is described in the next novel. In the movies, Bond girls disappear and are rarely, if ever again, referred to. I like that her presence carries over into the next novel, even if she herself doesn't appear. Really enjoyed your enthusiasm for this one as it, along with MOONRAKER, is the 50s title I usually consider the least successful but it's been an age so shall definitely have another go - cheers mate. Glad you liked the review, Sergio. I think this book gets a bit of an unfair rap, from myself included! Both times I went to read it, I was so eager to read the next in the series that this one took me aback both times. But sandwiched as it is between two books with somewhat fantastical premises, I think this is a very good slower-paced novel, although it's got plenty of plot as well! I agree with you that this is one of the best Bond books. It also has an interesting philospohical undertone and some of Fleming's best scenes, for instance the scene with the man whose blood group had been F.
If we're thinking about the same scene -- and I think we are -- I agree entirely. It's a terrific moment. There are some shades of Chandler to be found in this story, I think; and of course Fleming was a great admirer of Chandler's, so he may have been making a conscious effort to emulate the man. Yes, it is that scene at the end where Bond has killed Winter, and Winter's eyes stare at him. I actually can't recall reading a scene quite like that in any other author. I think Fleming is a much better author, as an author, than some people give him credit for. As a character, Bond is now about 60 years old but still very popular. 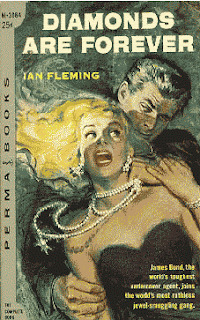 Partly I think that is due to the movies, but partly I think it is due to Fleming's abilities as a writer. I think that Fleming is able to write so well about Bond, and make us believe in the character, because at some level Fleming also believes in him. Fleming is able to reach into his subconscious, the way H. Rider Haggard could, and pump out Bond. I don't mean that Fleming believes he exists in reality but rather as a being in his mind. If an author believes in his character, and has any talent, he can make you believe in him also, and that contributes to his popularity. So Robert Howard believes in Conan the barbarian and can transmit that belief to you. Haggard believes in Allan Quatermain and that makes the character more real. Norvell Page believes in the Spider, and so can make you believe also, no matter how crazy the stories get (and Spider stories can get extremely crazy). I think Fleming could do the same thing with Bond, and that is why these characters are all still around. That's a very interesting idea. You could make a similar argument for Sax Rohmer and Dr. Fu Manchu. The stories would never be published in our time because of the racist commentary, but Rohmer himself seemed to believe in his creation, and there's a narrative drive to the stories that makes them very readable--even today--if you're willing to sit through the less palatable stuff. It also places Rohmer's work miles above that of his many imitators.